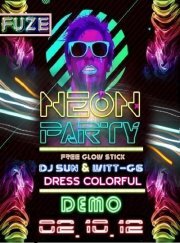 Fuze Entertainment presents NEON RUSH at DEMO! We bring you another sick night out this time at DEMO! Get your brightest colorful pants, shirts, kicks, headbands, shades, accessories etc. out of the closet & lets shake it down on the dance floor with our florescent DJs that will take the adrenalin outta you plus shitload of extra lasers and lights!!! Entry: FREE GLOW STICKS & FINGER LIGHTS! !